Since I was an infant, playing, composing and improvising have been inseparable elements of my music making. Thanks, in large part, to the private encouragement of the great Martha Argerich, improvisation is a prominent element of my performing life today. In 2011, the time came to write something down, to compose my official Opus 1. I had been waiting for the right story to tell, to set in ink and record. Feeling a profound sense of the loss of my native Venezuela to unprecedented levels of violence and corruption, I wrote Ex Patria. Dedicated to the 19,336 victims of homicide in 2011, it is a polemical tone poem, an unapologetic vision of Venezuela’s accelerating civic collapse and moral decay, manifested by a further 21,692 homicides in 2012, and 24,763 in 2013. “As an expatriate Venezuelan, it may be of little surprise that I should wish to express, in music, a longing for the beautiful country of my birth. However, my debut as a composer reaches beyond private nostalgia to a very public cry. Ex Patria is a portrayal of a country barely recognisable from that of my youth. It is my emotional response to the loss of Venezuela herself to lawlessness, corruption, chaos and rates of murder among the highest in the world. The opening chord is intended to jolt the public from silence and apathy. It is the immediate exposure of a tragedy, which has accelerated beneath the thinnest veil of democracy with negligible and inconsequential international scrutiny. The motifs introduced by the French horn and piano reflect a fleeting recollection of an innocent moment, an ominous calm. The theme is quickly brutalised, corrupted and stolen by an imposing, percussive and militaristic interruption, the “martellato” section depicting the daily gunfire to which Venezuelans have grown accustomed. Emerging from the violence, soloist and orchestra acquiesce in a slow and rhapsodic dialogue of mourning, culminating in a disconsolate and unison lament. The poetic rhapsody itself is soon subjected to a chromatic and accelerating decay, leaving the audience to glimpse the maddening disorder of a dismantled and suffocated society. By voicing her opinion against Venezuela’s Chavist government, Gabriela Montero has effectively written off returning to her country any time soon – doing so simply wouldn’t be safe. She is by no means the first composer to reflect their disillusionment with the state of their homeland in music, nor will she be the last. Right from its earliest days, the history of music is dotted with the names of composers who have had to move away from the country of their birth. Some fled as the political or religious tide turned against them, some moved away as a point of principle – a protest against a regime they believed unacceptable – others simply crossed the wrong person at the wrong time. Many were in real danger if they stayed, either from the direct orders of those in power or as a result of the state of general lawlessness that, paradoxically, so often accompanies totalitarian regimes. From their position of relative safety abroad, the composers’ reflections on their fate were similarly varied – from expressions of longing at the country they have had to leave behind to bitterness at those who made their exile necessary to, occasionally, an optimistic embrace of the opportunities offered by their new surrounds. Many revealed their feelings in music, often powerfully so. It is in the 20th century that we find the most notably outspoken composer exiles – unsurprisingly so, given that this was the century that hosted not only some of history’s most notoriously abhorrent regimes in some countries, but also unprecedented freedom of speech and means of expressing it in others. Those who fled Europe during the rise of Nazism, in particular, are many. Among their number were not just Jewish composers such as Schoenberg and Korngold, but also composers such as Martinů, whose association with Czech nationalism put him at risk, and Bartók, who simply couldn’t bear to stay and witness the fate befalling his beloved Hungary. Bartók would go on to have a fairly miserable time in the US, as did Martinů, who arrived there in 1941. As the man who had composed the celebratory Czech Rhapsody cantata when Czechoslovakia won its independence at the end of World War I, Martinů wore his national pride on his sleeve, but it was that very association with Czech nationalism that would also put his livelihood in danger. In 1943 he wrote his symphonic poem Memorial to Lidice, marking the fate of a Czech village that was razed to the ground and its people massacred on Hitler’s orders – the quotes of the Czech St Wenceslas Choral and, pointedly, the “destiny” motif from Beethoven’s Fifth Symphony are no accident. Erich Korngold, Schoenberg’s fellow Austrian and fellow Jew, also forced to live abroad and also suffering the indignity of having his music banned at home, expressed his thoughts in a different way entirely. Deeply depressed and homesick after moving to the US, Korngold turned his back on music for the concert hall and directed his attention instead towards film scores. “It was as if he had made a vow that he would write no more ‘absolute’ music as long as the horror in Europe was weighing on the world,” wrote his wife Luzi. Wherever there were dictatorships in 20th-century Europe, there were exiled composers. In Italy, the rise of Mussolini saw the departure to the US of Mario Castelnuovo-Tedesco, while in Spain, Manuel de Falla had no time for General Franco’s regime and, in 1939, promptly accepted a new post in Argentina. De Falla’s move was a notably pointed one, as Franco had been courting this most Spanish of all composers to serve as the country’s national composer. Given his efforts at stamping out Catalan nationalist culture, Franco was probably then none too impressed that de Falla’s new opera, Atlántida, happened to draw on a Catalan poem as its inspiration. One assumes, on the other hand, that Roberto Gerhard – a Catalan composer who moved to England in light of the suppression of his music in Spain – must have approved wholeheartedly. If Stravinsky’s message was delivered subtly through his music, Nicolas Nabokov’s was done bluntly and in person. Born into an aristocratic family that had fled Russia for the US in 1917, Nabokov, whose work includes the ballet Union Pacific and the opera Rasputin’s End, made it his mission to expose the truth about Soviet music. When, in March 1949, Shostakovich arrived in New York as the star name of a Soviet delegation taking part in an arts conference at the Waldorf Hotel, Nabokov was waiting. As he reached the end of his speech, Shostakovich found himself being aggressively quizzed about artistic freedom under Stalin – questions that Nabokov knew the Soviet composer, several of whose own works were banned in Russia, would be unable to answer. Nabokov followed up his attack with his own post-conference speech, bemoaning the fate of Soviet musicians. Rachmaninov was not just a composer in the wrong place while in the US; he was to some extents also a composer in the wrong time. While others – from Schoenberg to Stravinsky, Berg to Bartók – were taking music in new directions, his own compositions still sat at the very heart of old-style Romanticism. As someone who both composed and performed at the highest level, he was something of a dying breed too. Composers have, of course, been performing their own works since the likes of Byrd and Dowland sat down with their virginals and lutes in the 16th century. It was in the early 19th century, however, that a new phenomenon arose – the extraordinarily talented virtuoso whose equal brilliance as composers enabled them to write the sort of music that would show off their exceptional talents. As a composer-performer, Rachmaninov was enviably naturally talented on both fronts: his innate gift for writing a beautiful tune has ensured that his popularity as a composer has never waned; and as for his playing, when a poll was conducted among 100 leading concert pianists in 2010, he was voted the greatest pianist in the era of recorded sound. And yet, as said, even he struggled to keep the flow of compositions going once the demands of the concert tour took up his time. And perhaps that explains why those who both perform and compose at the highest level have become so rare? Such is the pace of the musician’s life today that combining the two roles has inevitably become impossible. Nor does today’s neatly bracketed, conveniently labelled world seem that comfortable with those who multi-task: composers should compose, players should play. The mission of YOA Orchestra of the Americas is to empower young musicians to reach world-class levels of excellence, to give support to one another throughout their lifetime, as well as to transform the communities they touch and the countries they live in. In pursuing these goals, freedom of expression and mutual support are central to their intellectual, ethical and personal development. 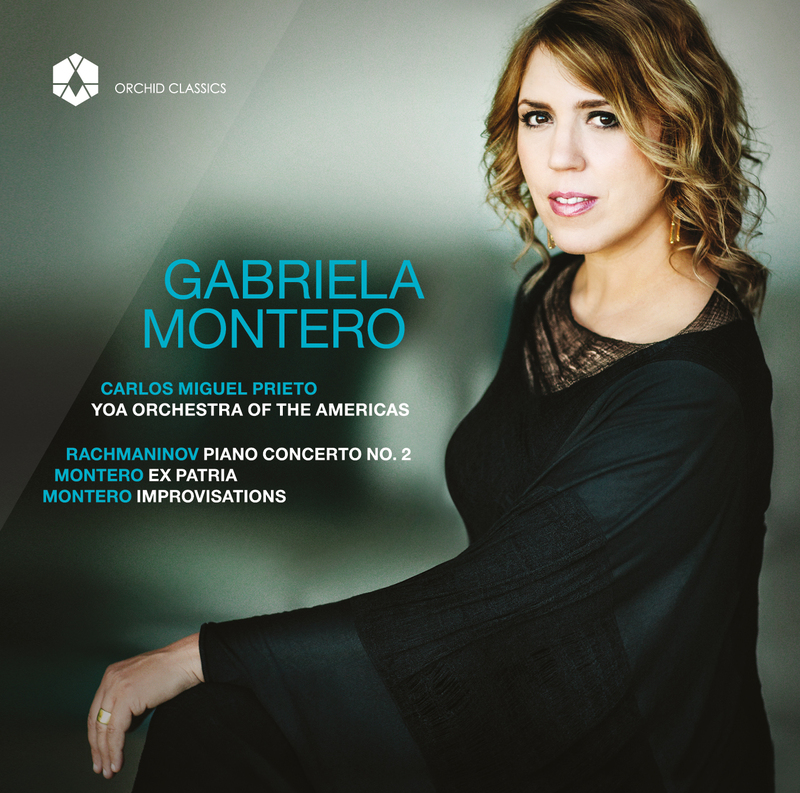 Gabriela Montero, one of the greatest musical talents of the Americas, is a champion of these ideals. It has been our great joy to join her in performing her first work for piano and orchestra, “Ex Patria”. A most noble expression of a longing for her, and my own, now-suffering, country of birth, Venezuela, where there once was the freedom to learn and grow in peace without fear of death or incarceration. The artistry in Gabriela’s music will always find beauty, even in the most trying of circumstances. But the world needs to know the pain we Venezuelans feel and can only express in thelasting humility of our artistic expression. We dedicate the YOA performance to all those who seek peace and freedom in the world and, particularly, in Venezuela.